With the announcement of the new Air Defense Identification Zone (ADIZ) on 23 November, Beijing has elevated its territorial claims in the East China Sea to a higher level, literally. Chinese officials and experts were quick to argue that the newly established ADIZ is no different from those of other nations and that its purpose is solely to provide stability and security in the designated area. However, the casual observer would be foolish to take these statements at face value. 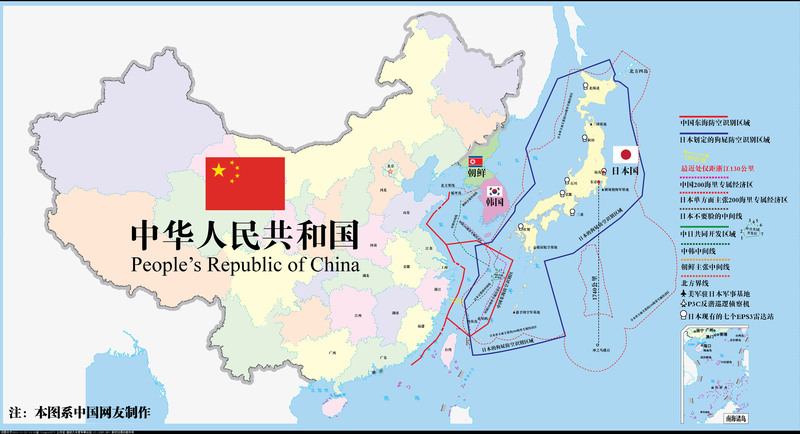 The main intention is to reassert its sovereignty over the Diaoyu/Senkaku islands and to test the strength of the U.S.-Japan defence alliance. After the announcement, Xinhua News Agency published a set of conditions that all aircraft within the new ADIZ must abide by (or face the consequences). The conditions contain the threat of ‘defensive emergency measures’ adopted by China’s armed forces and establish China’s defence ministry as the organ responsible for administration of ADIZ and explanation of its rules. As noted, ADIZs are not unusual and the U.S. and Japan have established their own in the past. The purpose of an ADIZ typically is to monitor air traffic before it enters into territorial airspace from the outside. Establishment of ADIZ is not a provocative step in itself, yet Beijing imposed the ADIZ abruptly on its neighbours and the U.S. as a major stakeholder without any prior consultation. Moreover, China’s new ADIZ goes beyond the usual practice when it applies the rules on all aircrafts, civilian or state (military, law enforcement, etc. ), no matter whether they are approaching China’s sovereign air space or merely passing through the area with final destination other than China. While in the case of the former ADIZ rules are reasonable and widely exercised, in the case of the latter Chinese demands go against the principle that waters and air space outside of the territorial domain are free to access by any state. Chinese proposition, highly problematic in terms of international law standards, is perfectly consistent with Beijing’s assertion about maritime Exclusive Economic Zones, i.e. that these are areas within which outsiders have to ask for permissions if they intend to conduct activities such as military exercises, reconnaissance, surveillance or training missions. While it is reasonable that Beijing is not overly excited with the U.S. military activities in close proximity to Chinese coast, these are not illegal and Beijing does not do its case good service by pursuing far-fetched interpretations of respective international treaties. However, although this all is relevant, the whole case is not primarily about the extent of national jurisdiction within ADIZ/EEZ established over otherwise international space. The main issue with the Chinese ADIZ over the East China Sea is not about an unorthodox approach to rules that should govern this ADIZ but with the very fact that China’s ADIZ (red line extending from the China’s coast between Taiwan and Korean Peninsula on the map) overlaps with a previously established Japanese ADIZ (blue line) and includes Diaoyu/Senkaku islands which are claimed by China but are under control of Japan. The islands themselves are of little significance but waters around them contain important fish stocks and potentially significant deposits of hydrocarbon resources. Tensions over the ownership of the islands escalated after September 2012 when Japan’s government purchased the islands from private owner which invited uproar from Beijing and the decision was preceded and followed by number of anti-Japanese demonstrations in China. The newly founded China’s Coast Guard that emerged from multitude of law-enforcement agencies stepped up its patrolling in the area and Beijing is increasingly active in the air space around disputed territory. In January this year, PLAN’s vessel locked its weapons radar on Japanese patrol ship, in October Japan’s defence ministry announced it is considering rules for engaging and possibly shooting down of China’s surveillance drones intruding in Japan’s air space. In 2012, number of Japan’s air force scrambles as a result of an intrusion by Chinese plan exceeded those by Russians for the first time (306 Chinese, 246 Russian). Similarly, within 12 months since Tokyo nationalized the islands, 68 incursions of Chinese vessels were recorded. This increased activity is part of strategy to change the status quo and create a fait accompli situation where the presence of China’s coast guard and its navy and air force will be the new normal. In short, tensions were rising even before the last Chinese step and contrary to voices from Beijing, establishment of ADIZ will mean everything but increasing the security in the area. So far, reactions to Chinese ADIZ were overwhelmingly negative. Naturally, Japan has strongly denounced the decision as expected. Thus, main focus was on the reaction of the U.S. Both Secretary John Kerry and Defense Secretary Chuck Hagel expressed deep concern with China’s unilateral attempt to change the status quo. Interestingly, Hagel explicitly pointed out that Article V of U.S.-Japan mutual defence treaty applies also to Senkaku Islands. On 25 November, in an act of defiance, the U.S. sent two unarmed B-52 bombers on a training flight into the Chinese ADIZ without complying with Beijing’s conditions. The purpose was to express disagreement and at the same time send signal to U.S. allies in the region as well as to Beijing. While governmental-level reactions were that of rejection, the reactions from airlines were mixed. Japan Airlines and All Nippon Airlines initially decided to comply with Beijing’s demands and provided flight plans to Chinese authorities, however later on this decision was reversed. Korean airlines would not comply unless the government issues new guidelines, and U.S. airlines would not comply either. Nevertheless, Taiwan’s airlines started to provide its flight plans as requested which was justified by Taiwan’s transportation minister based on safety concerns. The questions that naturally arises is how, in the light of expected disagreement with China’s ADIZ, Beijing plans to enforce the rules it has announced. Some experts question China’s capability to enforce the rules. Under the conditions where some airlines would comply, some won’t, strict enforcement could easily become a nightmare for the Chinese air force. 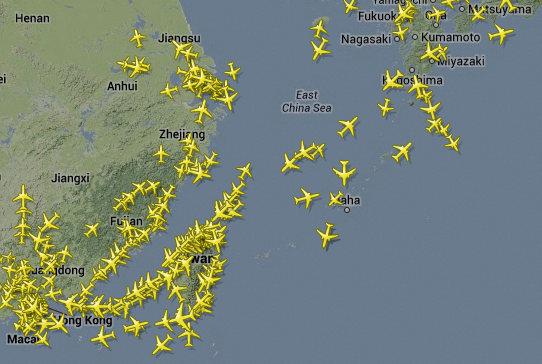 The picture below (taken from http://www.flightradar24.com) gives a rough idea how busy the traffic is in the region and this does not include military and law enforcement aircraft in the area. Therefore number of experts argue that in the beginning enforcement will be mostly rhetorical and slow but incidents similar to 2001 clash between U.S. surveillance plane and China’s fighter jet near Hainan may follow. There is another important aspect to consider while analysing recent Chinese actions. Beijing may be motivated to take a stance in regards to its sovereignty claim and it is consistently pushing the envelope in this matter. However, it is also interested in testing the reactions of the U.S. and its allies to get a clearer picture for its actions in the future. The Taiwan Strait missile crisis in 1995/96 might have backfired and in the short term it was Beijing’s debacle but at the same time Chinese leaders tested U.S. reaction. In addition, the crisis provided critical stimulus for the development of Anti-Access/Area-Denial (A2/AD) capability that nowadays represents significant challenge for any future deployment of carrier battle group near Chinese shores. More recently, during 2012 Scarborough Shoal standoff with the Philippines, China has tested whether the U.S. would go beyond rhetorical support of its treaty ally when the subject of dispute is relatively insignificant elevation. Creation of ADIZ and increased number of naval and air incursions in the disputed area should be understood as part of broader strategy to change the status quo. Should the ADIZ face no strong reaction or should the extent of backlash be acceptable for Beijing, second ADIZ may come soon, this time over the South China Sea. The risk for the U.S. and other stakeholders, given the recent developments in East and South China Seas, is that no response is likely to embolden China in the future. The decision to send B-52s on a training flight through Chinese ADIZ seems to be kind of appropriate response. However, there is equal risk of unintended incidents and following escalation. So far, there is no reason to panic as the likelihood of shooting war is relatively low but there is ample reason to be worried about the trend. This article was originally written for China Policy Institute.